This cottage is located in a secluded spot, in a picturesque setting among the fish ponds and forests of the Český ráj (Czech Paradise) Protected Landscape Area, on the Podtrosecká údolí (Valley under Trosky) Hiking Trail. The Český ráj Protected Landscape Area is an ideal place for hiking, cycling, fishing, and for fans of mountain climbing or mushroom gathering. There are many monuments, castles, châteaus, natural rarities and beautiful sights in the cottage’s wider surroundings. 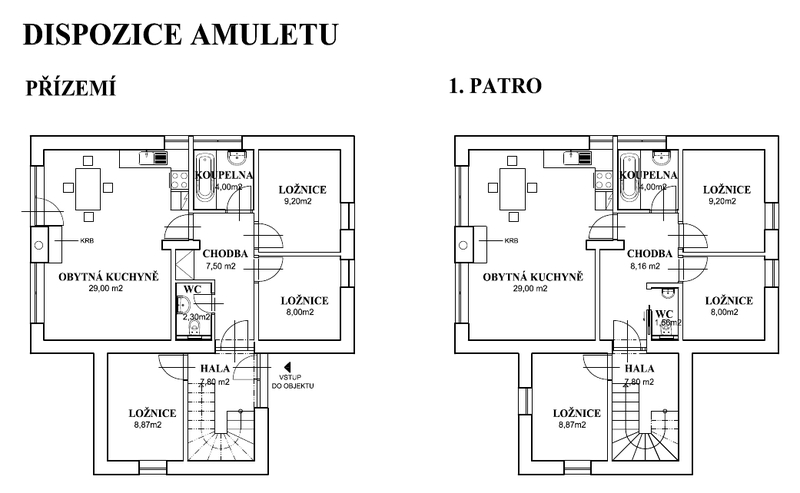 Accommodation in AMULET is arranged in two separate suites, one on the ground floor and one on the first floor, each for a total of 6-8 people. The entire building thus has a capacity of 12 beds (up to 16 with cots). Both suites are made up of three bedrooms, a living room with a kitchenette, a bath, and a separate WC. The cottage is furnished with stylish furniture and a fireplace; it has a completely equipped kitchenette with a refrigerator, an electric stove top, and has bedclothes and a TV. The cottage is located in the quiet setting found directly under Trosky Castle, surrounded by beautiful nature, sandstone rocks, and three fish ponds with the possibility of pleasant swimming. Children’s swings, a slide, a sandbox, outdoor table tennis, a basketball hoop, and a small multi-functional court (football, volleyball) are available near the building. Furthermore, we offer the possibility of outdoor seating with a barbecue, or eventually cooking over an open campfire. Cyclists can store their bicycles under lock in the lean-to. The excursion restaurant Vidlák is located 800 m from the cottage, a pleasant stroll along the Podtrosecká údolí Hiking Trail. Another opportunity for a pleasant time spent with good food and drink is the Hrubá Skála – Hotel Štekl restaurant, and also the restaurants under Trosky Castle or in the nearby spa of Sedmihorky. 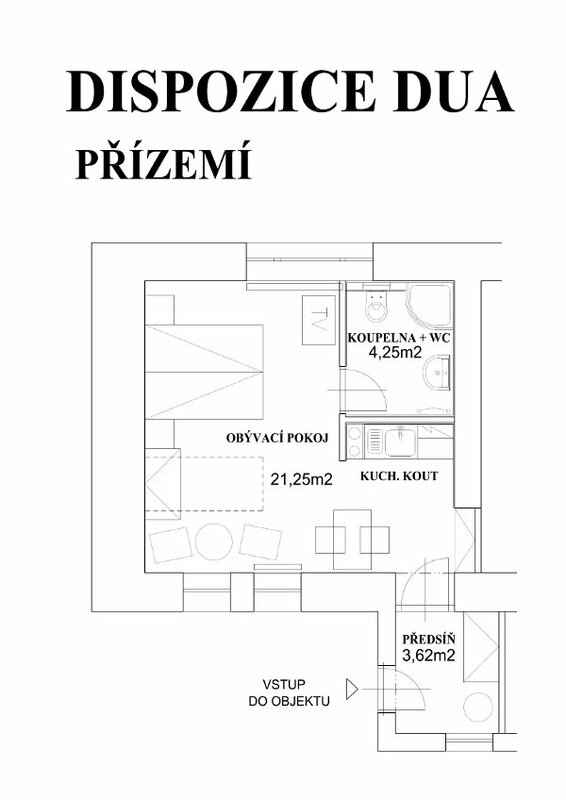 Type of building: Cottage – two separate suites: ground floor + first floor. Capacity: each suite 6-8 beds, the entire cottage 12-16 beds. Possibility of parking directly by the building. Accommodation in the AMULET – DUO suite is meant for two persons with the possibility of one extra cot in the direct proximity of the AMULET cottage, which has a capacity of 12 (up to 16) beds on two floors. The suites are located in the quiet setting directly under Trosky Castle, surrounded by beautiful nature, sandstone rocks, and three fish ponds with the possibility of pleasant swimming. Swings for children, a sandbox, outdoor seating and barbecue, or eventually cooking over a campfire are available near the building. Cyclists can store their bicycles under lock in the lean-to. The cottage is furnished with stylish furniture made of the modern materials of today, has a completely equipped kitchenette with a refrigerator, microwave, electric stove top, as well as having bedclothes, TV, and a separate bath with a shower and WC. This suite is ideal for young couples in love, as well as for the rest and relaxation of older couples, or eventually for families with one child.